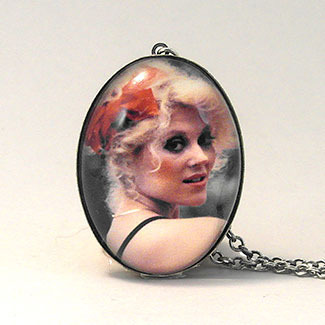 Audrey Landers, who plays Afton Cooper in the hit TV series Dallas, along with being an international singing star and performer has asked Schmutzerland to create a collectable jewelry line especially for her. All our products are handmade in the U.S. with the utmost care for quality and workmanship. The necklaces are all 30x40mm set in an antiqued silver ox setting with an 16" chain. (24" inch chain available for and additional $1.00) The earrings are 18mm round in an antiques brass ox setting with hypo-allergenic ear clasps and a little black swarovski cyrstal. Cufflinks are also 18mm round in a polished brass setting. All of the jewelry in the Audrey Landers Keepsake Collection come om a card in a sturdy gift box, perfect for gift giving.